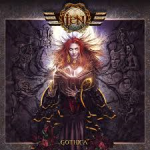 Share the post "Album review: TEN – Gothica"
Album number thirteen from the enduring melodic rockers Ten, which also sees them back on Frontiers in a multi-album deal. They have hit a purple patch these past few years, helped no doubt by the same line-up on the past three albums – including long-standing bassist Steve McKenna re-joining the band. Gary Hughes writes about a mixed bag of themes on this album, with a couple of classic horror stories given the Ten treatment, namely ‘Jekyll and Hyde’ and ‘La Luna Dra-Cu-La’ – the latter is a melodic rock beast and then some. Plenty of historical fare with ‘The Grail’, with its grandiose arrangements it harks back to the band’s sounds on their first couple of albums. Gary Hughes is credited with programming on the album and it shows up on each song, with plenty of sound effects which meld nicely with the keys playing of Darrel Treece-Birch. Henry VIII features on ‘A Man For All Seasons, again the keys and guitars lead the musical charge. With three guitarists Ten never over egg the musical pudding, using solos sparingly but effectively when used. This entry was posted in ALBUM REVIEWS, ALBUM REVIEWS (Mobile), All Posts and tagged album, Gary Hughes, Gothica, John Halliwell, melodic, review, rock, Steve McKenna, TEN. Bookmark the permalink.